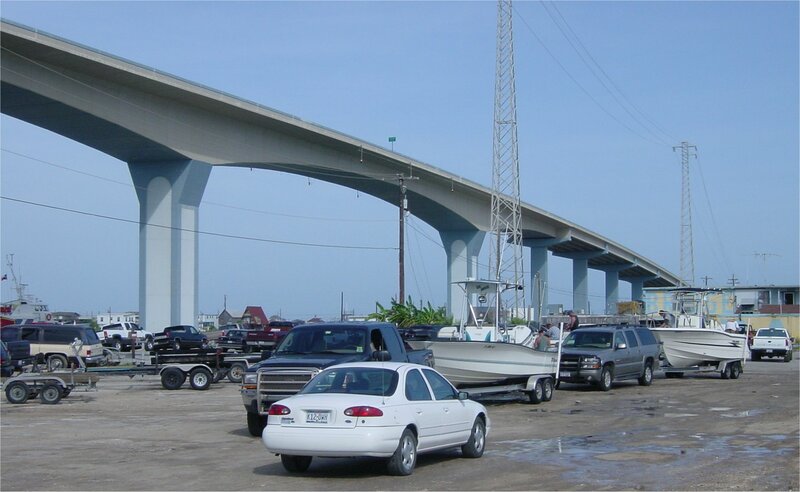 Approximately 50 miles south of downtown Houston, the Freeport/Lake Jackson/Angleton region is known as Brazosport Area, after the Brazos River which empties into the Gulf of Mexico at Freeport. The area is sustained by large Dow Chemical and BASF petrochemical plants in the area, but the city of Freeport itself is in bad shape economically. Lake Jackson is the best city in the region. The original 332 intracoastal crossing was opened on August 21, 1954. It was replaced with a new bridge around 1999. The new bridge appears to be a post-tensioned, cast-in-place concrete box girder design. The original crossing, opened on August 21, 1954. (high resolution 154k) View of the 332 bridge. Photo taken 21-July-2001. Driver's view approaching the bridge from the north. Photo taken 21-July-2001. (high resolution 136k) A view alongside the bridge. Photo taken 21-July-2001. (high resolution 200k) Adjacent to the bridge is a heavily used boat launch ramp. On this hot July day, the pleasure boaters were out in force. Photo taken 21-July-2001. (high resolution 113k) Driver's view on the bridge downgrade going toward Surfside. The Gulf of Mexico is just across the bridge. Photo taken 21-July-2001. (high resolution 169k) View from the bridge, looking east along the Intracoastal canal. Photo taken 21-July-2001. 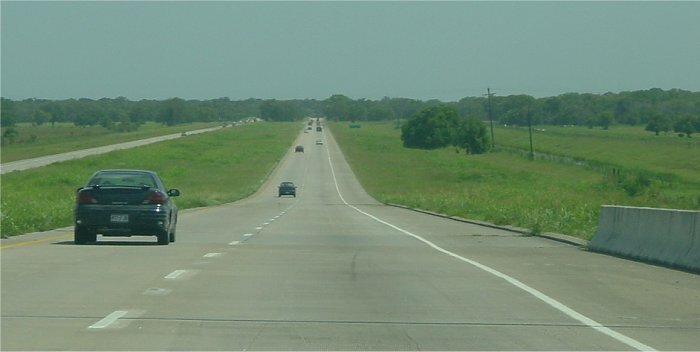 Highway 288 does not have full access control in this region, but it is free of traffic lights and supports high speeds. 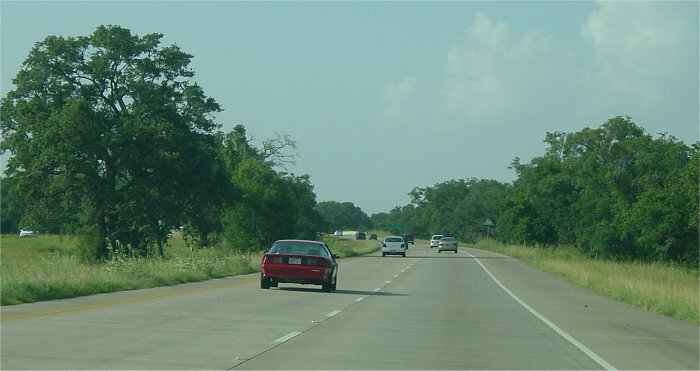 As 288 enters the Lake Jackson area, it becomes highway 332, which is an urban highway with traffic lights. TxDOT transportation plans show a $24 million project to add grade separations on 332, but the project is not funded so it will not happen before 2005. In the long run, 332 will be a freeway. (high resolution 129k) Looking north from FM 523 overpass. Photo taken 21-July-2001. (high resolution 89k) Looking north from the embankment at the overpass at highway 35. Photo taken 21-July-2001. Driver's view looking south. Photo taken 21-July-2001. Driver's view looking north. Photo taken 21-July-2001. Looking south along highway 332 in Lake Jackson. This is an urban highway with traffic lights, but there is sufficient right-of-way for a freeway. The first phase of the freeway upgrade will add grade separations, but is not funded as of 2001. Photo taken 21-July-2001. Another view along 332. Photo taken 21-July-2001. Approaching the Gulf of Mexico, 332 traverses through coastal marsh. This is a typical view from the highway. Photo taken 21-July-2001. The city of Freeport is a rather grim landscape of abandoned and run down buildings. Very few people actually see Freeport, because most vistors to the area go to Surfside, which is a few miles to the north. (high resolution 146k) View along FM 523 with one of the Dow Chemical plants. Dow and BASF have large operations in the area. Photo taken 21-July-2001. (high resolution 146k) View from the 523 bridge over the Freeport ship channel. Notice the storm surge lock. That is a highly unusual design. I've never seen anything like it anywhere else. (However, I don't usually travel the coastal regions of the United States.) Photo taken 21-July-2001. (high resolution 176k) Looking southwest along the coast. 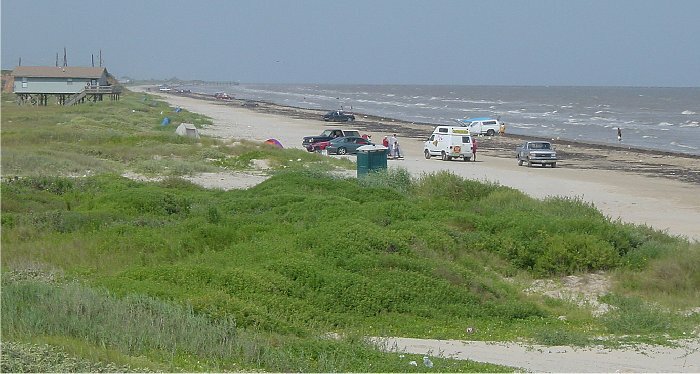 Non-Texans may not be aware that nearly all Texas beaches are open to vehicular traffic. This beach is not particularly crowded. Back in my high school days, certain sections of Galveston Island would become so jam-packed with cars that once you entered, you would not be able to leave until the evening. Photo taken 21-July-2001. Looking northeast along the coast. Photo taken 21-July-2001. 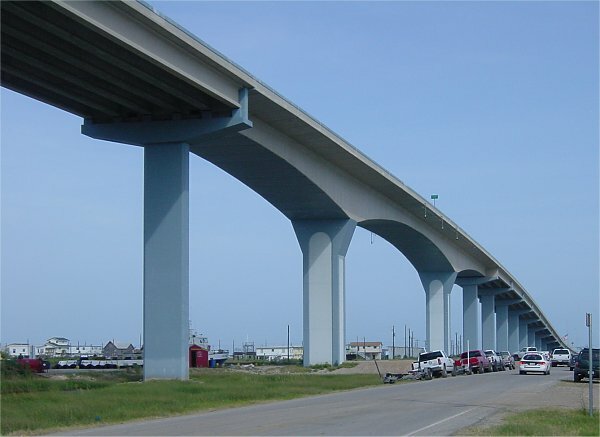 Highway 36 crossing over the Brazos River. The Brazos is the longest river in Texas. Photo taken 21-July-2001. (high resolution 176k) Looking south from the highway 36 bridge. The Brazos River in this area has been channelized and is navigable for barge traffic. Photo taken 21-July-2001.